The Cabot’s tragopan (Tragopan caboti Gould 1857) belongs to the well known order of the Galliforms (Galliformes), to the colourful family of the Pheasants (Phasianidae), to the genus Tragopan, which includes a group of Asian mountain and forest pheasants known under the generic term of “Tragopans”, and to the species Tragopan caboti. 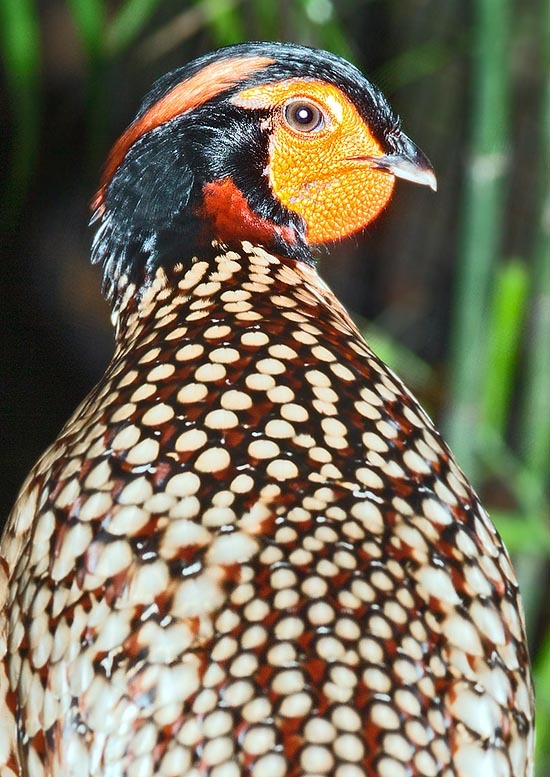 The species has two subspecies: the Tragopan caboti caboti Gould, 1857, present in the south-east of China and the Tragopan caboti guangxiensis Cheng & Wu, 1979, present in a small zone of the centre-south of China. The name of the genus “tragopan” comes from the Latin and indicates a bird, mentioned by Pliny and Pomponius, mythical, horned, with purple head. The name of the species, “caboti”, has been attributed in honour to the Dr. Samuel Cabot (1815-1885), American physician, ornithological curator for the Boston Natural History Society. 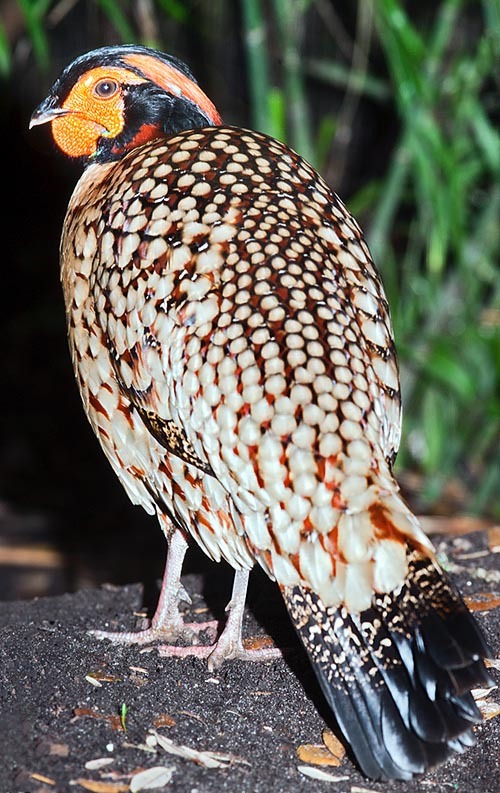 The Cabot’s tragopan is a species with exclusive Chinese distribution; the nominal subspecies “caboti” is located in south-eastern China (from the Guangdong, Fujian, Jiangxi, to the Zhejiang provinces). The other subspecies “guangxiensis” is present in a limited area of the centre-south of China (in the north-eastern Guangxi, which has given the name to the subspecies, and in the southern Hunan). It is a pheasant of subtropical mountain living permanently between the 600 and the 1800 m of altitude; contrary to the other species belonging to the same genus (other tragopans), it seems not to come further down even in winter (the annual changes of altitude amount on average on the 300 m). It lives in evergreen forests with deciduous plants and in mixed forests where deciduous vegetation as well as of evergreen conifers is present. The preferred forests by the cabot’s tragopans are formed by vegetal species mainly belonging to the families of the Theaceae, Lauraceae, Rosaceae, Ericaceae, Symplocaceae, Fagaceae, Aquifoliaceae. It is present also in the open mountain areas over the limit of the arboreal vegetation. It has a compact, roundish and massive shape, with tail of medium size. Like in many species of pheasants, the sexual dimorphism is quite evident with multicoloured male and the female with a very mimetic livery. Also the size is different with the male being about 60-62 cm long of which 20-21 cm due to the tail, and a weight of about 1400 g; the female is smaller having a total length around the 50 cm of which 15-16 are due to the tail and a weight of about 900 g.
The male has a very particular, distinctive and unmistakable livery due to the spotted and clear look characterizing it and which neatly differentiates it from the other species of the same genus. The clear spots, of milky coffee-caramel-leather yellow colour are perfectly round on the back which shows, between each two spots, a lively dark red coloured background and some lines, n the margin of the clear spots, of black colour. These three colours contrast harmoniously and bright between themselves. The colouration of the spots and the spots themselves merge in the ventral part that becomes totally of uniform milky coffee-straw colour. The head is surrounded by black parts: black is the vertex of the head starting from the dorsal base of the beak, black is an ample part of the cheeks extending laterally, and black is a belt in the chinstrap. These black parts are linked together and surround the face of the bird which is glabrous and covered by abundant skin of gummy appearance and by a characteristic lively pale orange colour forming also an arcuate plica (always orange) under the throat. The distal ventral part of the skin (distal chinstrap) presents a light blue colouration. This part, during the courting, may be dilated and expanded to form a very long wattle-strip of skin, lively coloured with geometric drawings. These have the bland shape of dark red squares merged to form a drawing which recalls a sort of a comb with enormous squared and chamfered teeth, facing inward, on each side of the spread wattle. The red drawings are surrounded by edges-stripes of pure light blue colour. The central part of this long and extended wattle is orange like the face. This incredible wattle, extremely extensible (like a piece of cloth, for several cm on the chest) is typical of the tragopans in general and it is widened during the phases of courting. During this time, the male shakes the head up and down, extends the wattle, flaps its wings and then stretches the whole body upwards in a typical display. Always during the courting, the Cabot’s tragopan can make visible a sort of dorsal wattles of the head, placed behind the glabrous part of orange skin which forms a sort of eyebrow. These fleshy appendages have the typical shape and position of small light blue horns. In the black of the cheeks is present a spot of lively red-brick feathers which recalls the red of the back. From the black vertex start two tufts of pale orange feathers, which recall the colour of the face, and which meet behind a central trait of black feathers (which continue from the vertex of the same black colouration); these tufts, merging behind, form a sort of golden-orange crown. The tail has brown, dark streaked rectrices with brown-blackish final part. The wings have remiges streaked of brown-dark colour; dorsal coverts of the wing and lower coverts more shaded of brown-fawn. The beak is robust and of horn-fleshy colour, the legs (strong and of scratcher) are of grey-fleshy-reddish colour with grey-dark nails; the iris is brown-greyish. The female, tiny, has brown-blackish-reddish colouration, more greyish in the lower parts. These nuances are shaded and mixed to form speckles, streaks, moiré patterns and smoky-cryptic drawings. On the back are present some small white triangular spots. Beak and legs, similar to the male’s, are darker; the iris is brown. The female of Cabot(s tragopan might be mistaken with the female of the Temminck’s tragopan (Tragopan temminckii); the two species can be co-present in the western part of the home range. The female of the Temminck tragopan, in respect to that of the Cabot’s tragopan, has an ample pale spot on the abdomen; the white triangular small spots more marked and the skin surrounding the eye is of bluish colour. The Cabot’s tragopan has an alimentation linked to the vegetation of the woods where it lives. In winter it frequents the areas rich of nuts produced by plants belonging to the genus Lithocarpus and Cyclobalanopsis and zones where it can find capsules with seeds of Schima superba. At dawn and at the sunrise, these tragopans have been observed while eating of trees of Daphniphyllum macropodum. The species, in fact, is strongly associated to the presence of this tree: the 45% of the specimens was eating on the trees themselves, the 48% of the Cabot’s tragopans, conversely, were eating on the ground, the 7% of the birds were nourishing on trees of other genus. The trees of Daphniphyllum macropodum give the Cabot’s tragopans food thanks to their leaves and fruits and are, moreover, often utilized for perching. The subspecies guangxiensis nourishes manly of seeds of plants belonging to the genera Castanopsis, Moghanis, etc. These information have been collected thanks to the studies performed by radio-tracking. Usually, the reproduction takes place between March and May. This pheasant, like other tragopans, has arboricolous habits and often the nests are placed between the 2 and 10 m of height. The nests are often located on Taiwan red pines (Pinus taiwanensis) or on broad leaved trees at the edge of the forest or on ridges. The suitable sites for nesting are not many and result in being a limiting factor for the wild populations, so much that, if furnished, the species adapts to utilize hanging artificial nests (like a basket); also the captive specimens reproduce utilizing, willingly, hanging baskets. As a matter of fact, the tragopans are not capable to build nests ex-novo, but adapt natural platforms of vegetal material which accumulates naturally in the forks of the autochthonous trees. The replacement of the original vegetation with plantations of bamboos and conifers, which do not favour the accumulation of vegetals to form platforms, complicates the nesting of the tragopans. It is the male who occupies the territory and the site of nesting, inviting the female with calls and chasing away the rivals. The hatching is usually formed by 3-5 eggs (2-6) of spotted clay-reddish-brown colour. Besides the already seen problems, the clutches of Cabot’s tragopan are subject to heavy losses (even much more than the 50%) caused by the bad weather (snow-rain) and by predators such as the jay (Garrulus glandarius), the yellow-throated marten (Charronia flavigula), the leopard cat (Felis bengalensis). The hatching, done by the female, lasts about 27-28 days. In captivity the couple is monogamous, at least for what concerns the mating and have been reported cases where the males of some species of tragopans have hatched the eggs and bred the pullets. Upon their birth, the pullets are already endowed with flight feathers and can therefore perform short flights as they can follow the mother even on the trees. The juveniles have big eyes, short beak, the dorsal parts coloured in brown-fawn and the ventral ones yellowish-whitish. The mother with the juveniles and at times with some males who mate later on (in autumn) gather n small family groups until just before the starting of the following reproductive season. The young are similar to the female, but the young males distinguish soon due to the bigger size and the darker colouration of the head-neck. The maturity is reached by the third year of age (some females may spawn already when two years old). The Cabot’s tragopan is a vulnerable species due to the scarce population distributed, in the not so very ample range, in a fragmented manner. Its situation is continuously worsening also due to the decrease of biodiversities of the original forests which are converted, by the man, into monotonous woods of conifers only, bamboos or other. Even if sure data are not available, it seems that the overall population is less than 5000 individuals. Although it has been shown that the preservation and the creation of reserves and of protected areas are important for the survival of this species; the continuous conversion of the natural habitats in cultivated areas, the deforestation, the fragmentation of the suitable habitats and the hunting pressure that torment the same protection zones are determining a progressive and continuous decline of the species. Other dangers are represented by the development of the urban areas and the subsequent construction of roads and railways. The situation of the subspecies guangxiensis is even less known. The Cabot tragopan is protected by the CITES and s matter of study and protection at the natural forests which host more then a half of the total population. Important interventions appear to be the reforestation with autochthonous essences loved by the species; the planting of artificial nests suitable for nesting and the utilization of a geologic book favouring the exchange of the specimens bred in captivity. A certain number of individuals, are, in fact, hosted in zoological gardens and in private structure of the entire world. Seen that the animals kept in captivity can aver important, with the presence of different bloodlines, this species should be bred only by serious breeders who at least should have the decency of not crossing them with other species of tragopan. The Cabot’s tragopans bred artificially, like other species of tragopans, are agreeable animals capable to establish a relationship with the breeder reaching to point to accept, from him, the food directly from his hands.